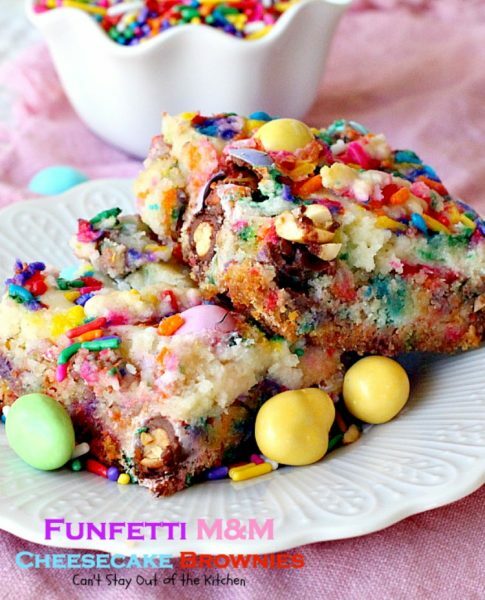 If you’re looking for an irresistible dessert for any occasion, or a great way to use up leftover Easter candy, you’ve got to make Funfetti M&M Cheesecake Brownies today! 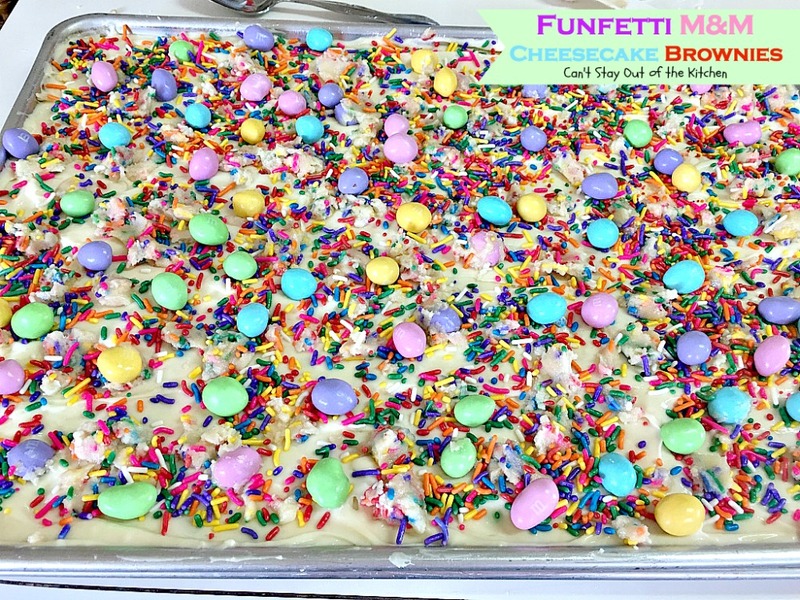 You will have a houseful of friends and family raving over this spectacular dessert and this dessert will certainly satisfy any sweet tooth craving you have. 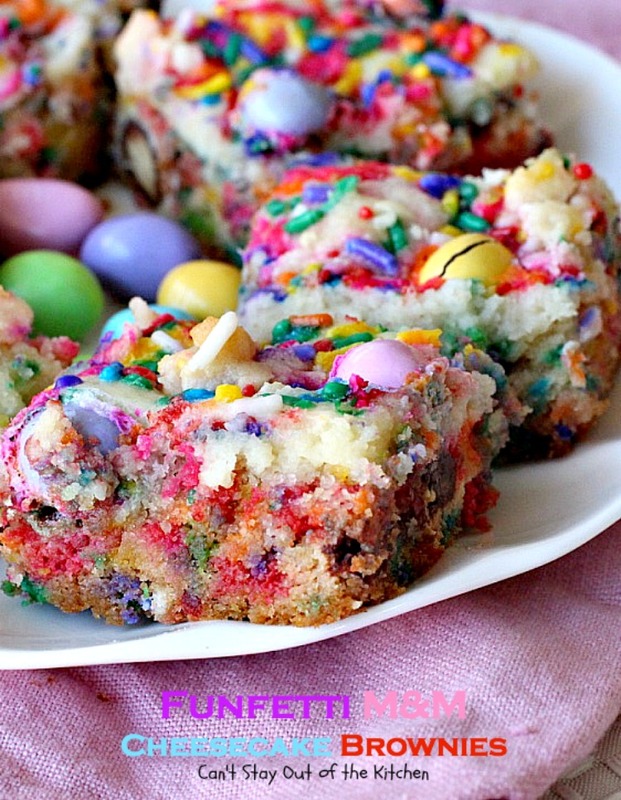 Funfetti M&M Cheesecake Brownies are irresistible! 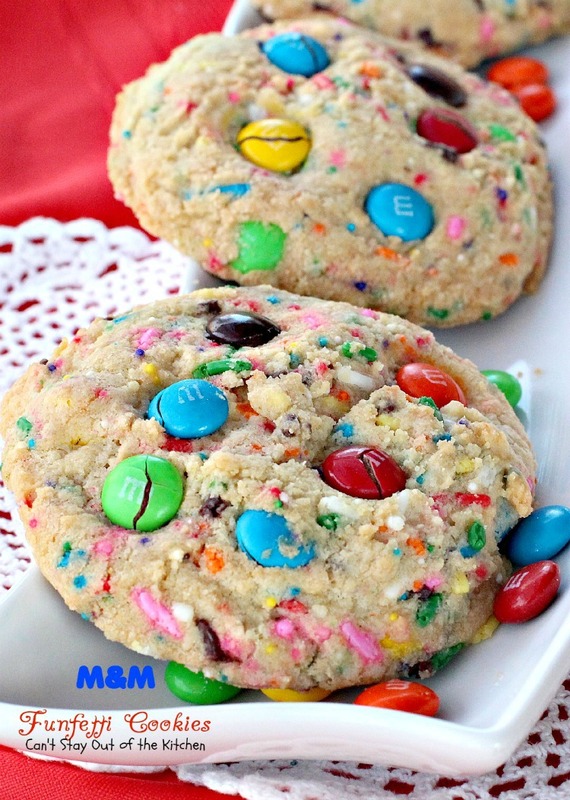 Peanutty, chocolaty M&M’s make the difference! 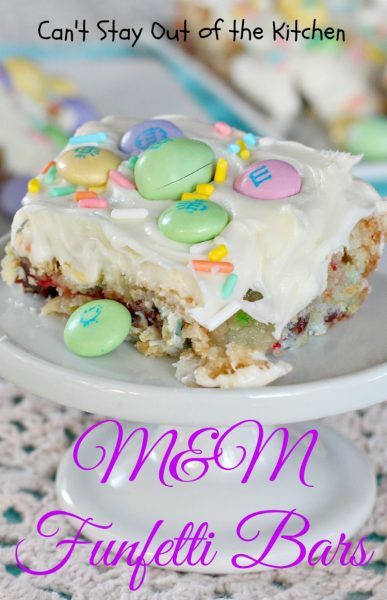 Every bite of Funfetti M&M Cheesecake Brownies will have you coming back for more! Pour funfetti cake mix into a bowl. Add eggs, oil, funfetti sprinkles and peanut butter M&M’s. Grease or spray an 11″x17″ jelly roll pan with cooking spray. 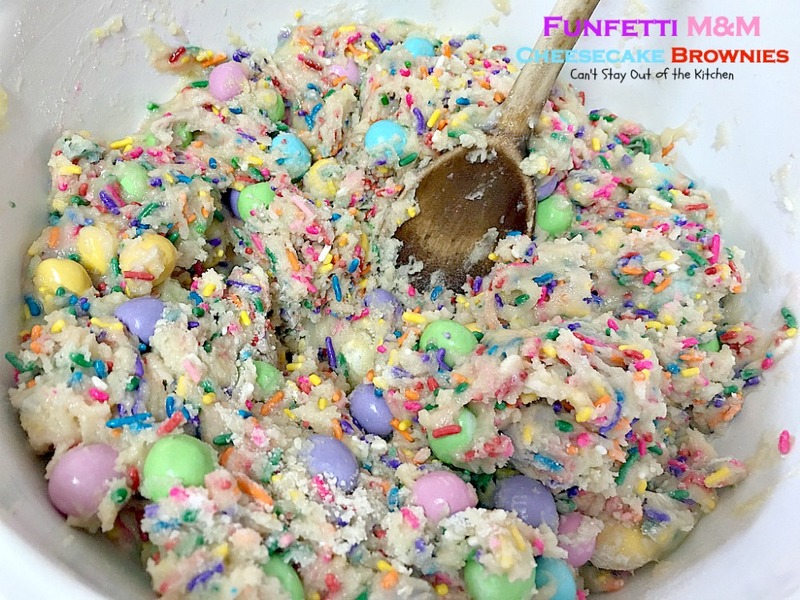 Press half to two-thirds of the cookie dough mixture into the prepared pan. 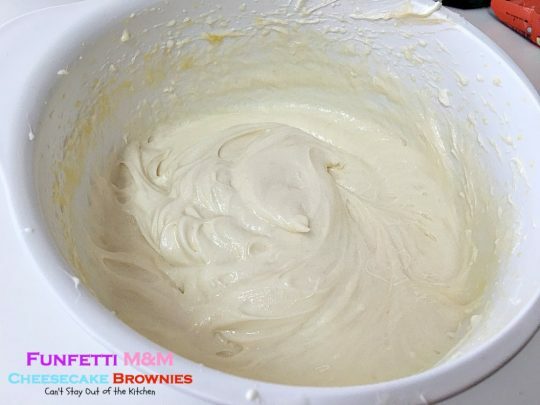 Cream ingredients with an electric mixer until no lumps remain. Spread cheesecake filling over top of cookie dough. 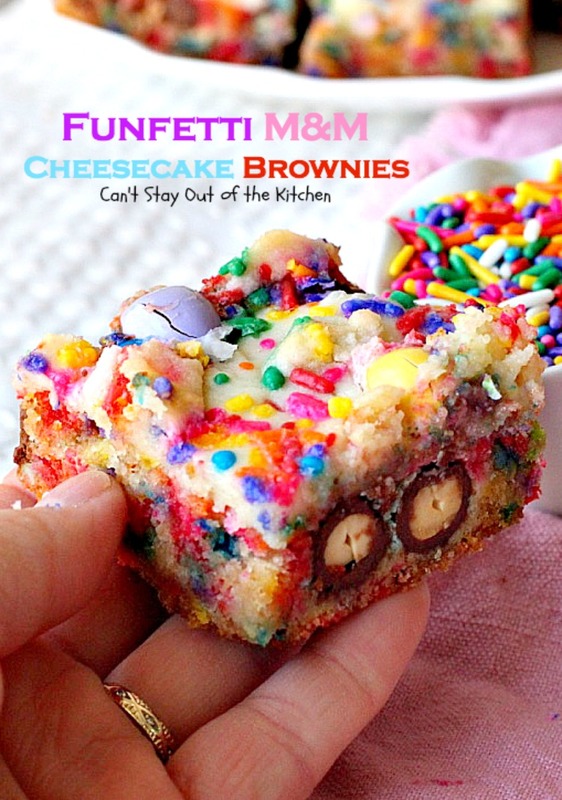 Crumble remaining cookie dough on top of cheesecake filling. 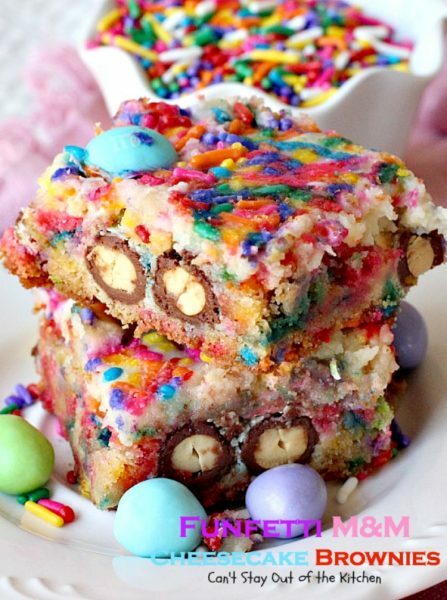 Sprinkle additional rainbow sprinkles and peanut butter M&M’s on top. Bake at 350 about 35-40 minutes or until a toothpick inserted in center comes out clean. Be careful! 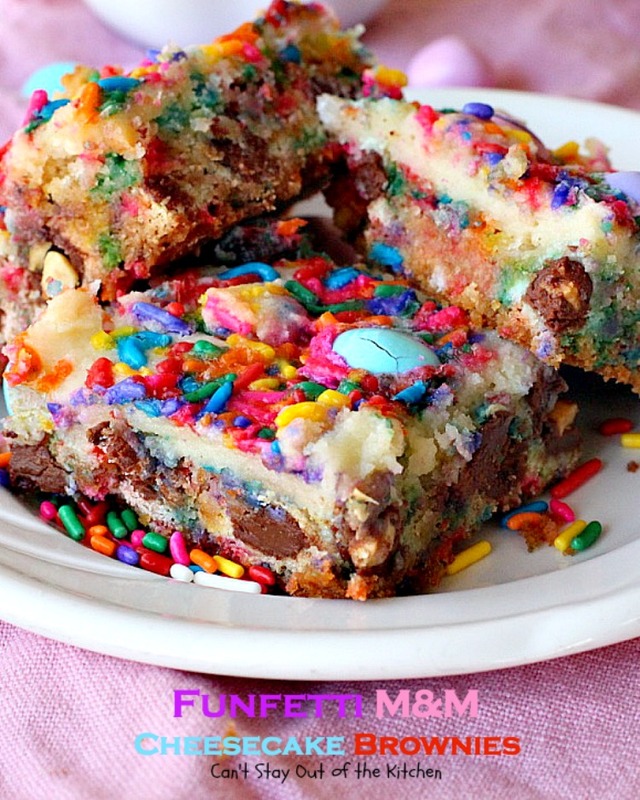 Funfetti M&M Cheesecake Brownies are addictive! If you love chocolate, peanut butter and sprinkles, you’ll rave over these brownies. 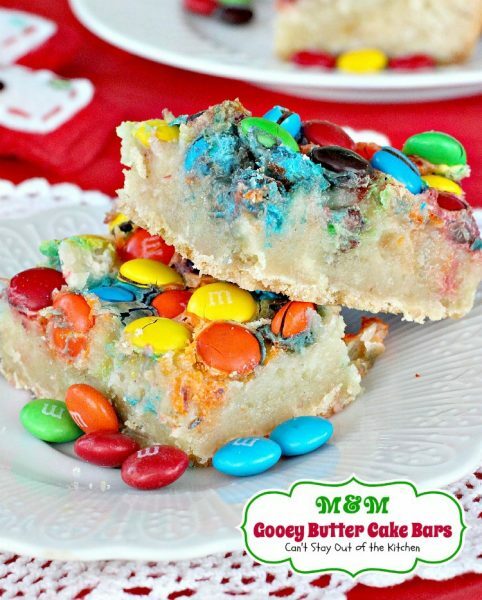 Take a plate of these jewels to any potluck or tailgating party and watch them disappear! These amazing cheesecake brownies are filled with peanut butter M&M's, rainbow sprinkles and a cheesecake filling. 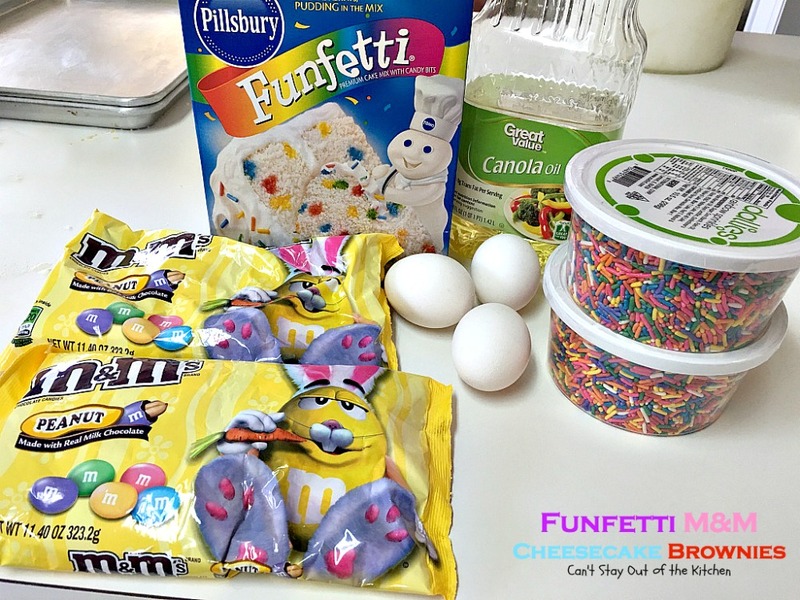 They start with a funfetti cake mix making them an easy and delicious treat that's great for tailgating parties. Also an excellent way to use up leftover Easter candy. Add 1 container rainbow sprinkles and 1 ½ bags M&Ms. Press a thin layer of cookie dough about ½ to 2/3 of the mixture into a 11x17” jelly roll pan that has been sprayed with cookie spray. Sprinkle remaining half bag of M&Ms and several tablespoons of rainbow sprinkles to cover the top. 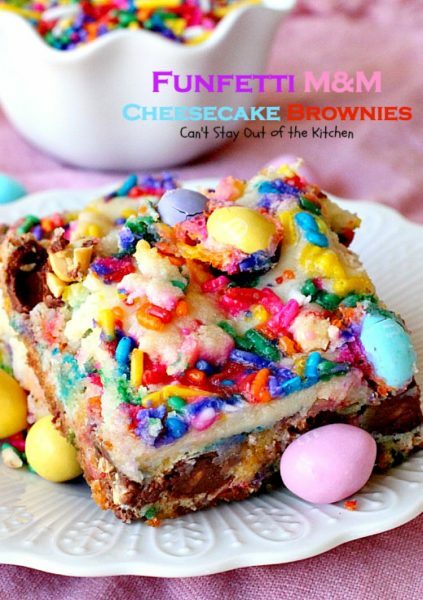 These amazing cheesecake brownies are filled with peanut butter [url href=”http://www.mms.com/” target=”_blank”]M&M’s[/url], rainbow sprinkles and a cheesecake filling. 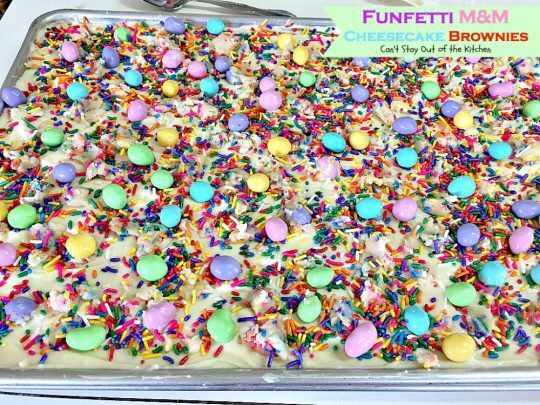 They start with a funfetti cake mix making them an easy and delicious treat that’s great for tailgating parties. 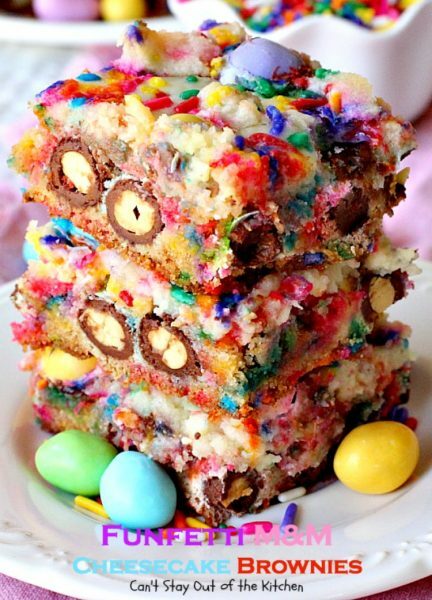 Also an excellent way to use up leftover Easter candy. Stir cake mixes, eggs, and oil together with a wooden spoon until no lumps remain in the batter. Add 1 container rainbow sprinkles and 1 ½ bags M&Ms. 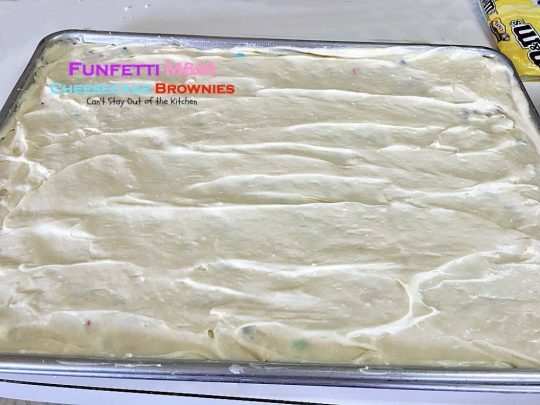 Press a thin layer of cookie dough about ½ to 2/3 of the mixture into a 11×17” jelly roll pan that has been sprayed with cookie spray. 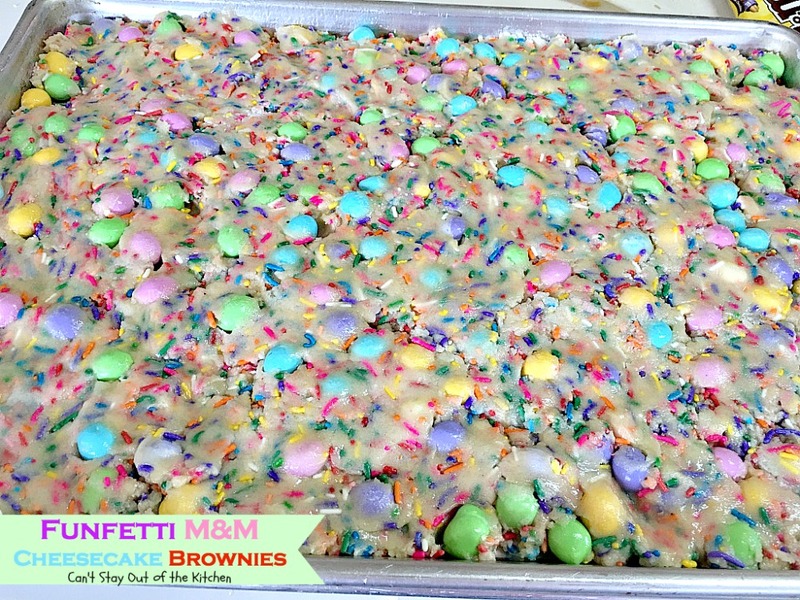 I loved the way these brownies turned out. I’m sure you will too. 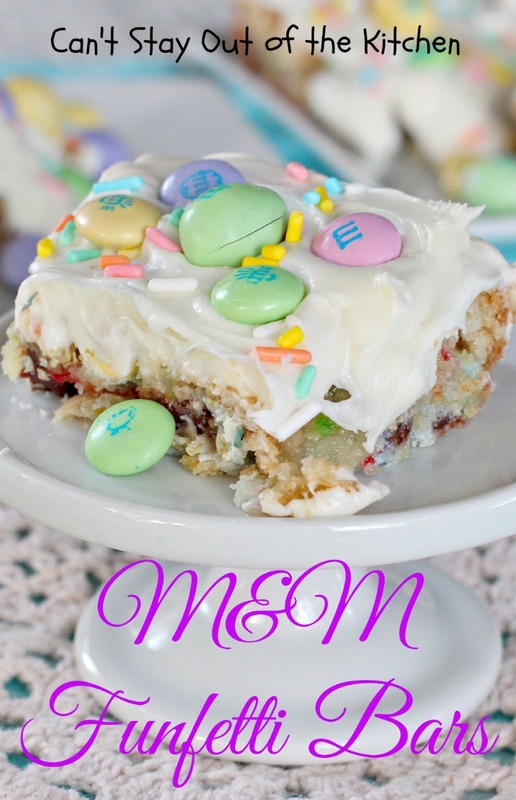 Funfetti M&M Cheesecake Brownies are a great way to use up Easter candy too! Hi there, In the picture above for the cream cheese ingredients. 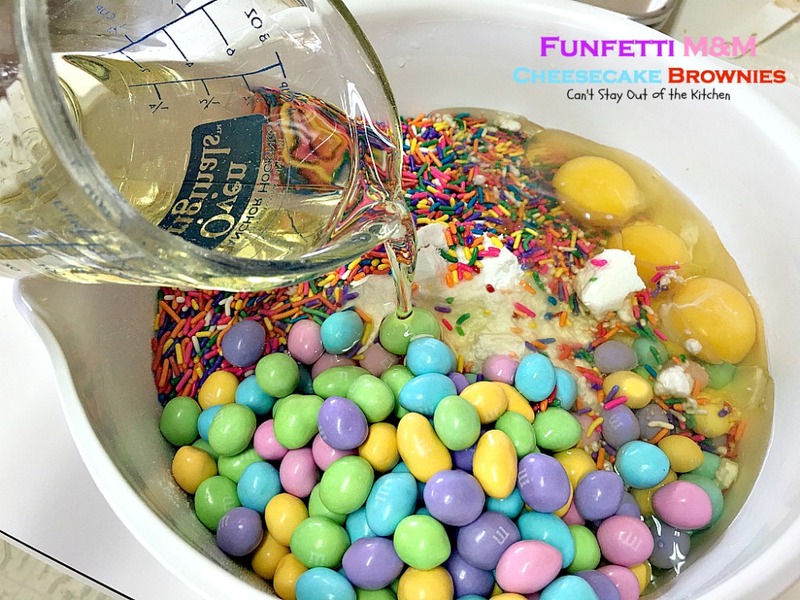 Could you please tell me what is in the measuring cup? 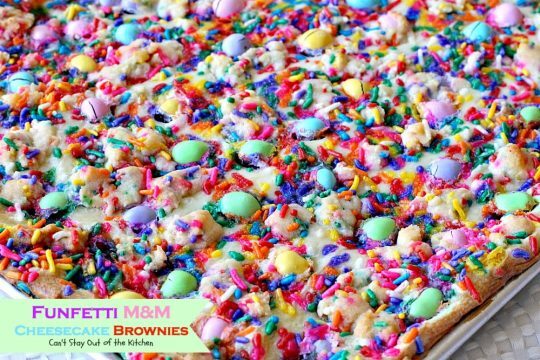 I don’t see any milk or liquid for the cream cheese topping. Hi, Fay. 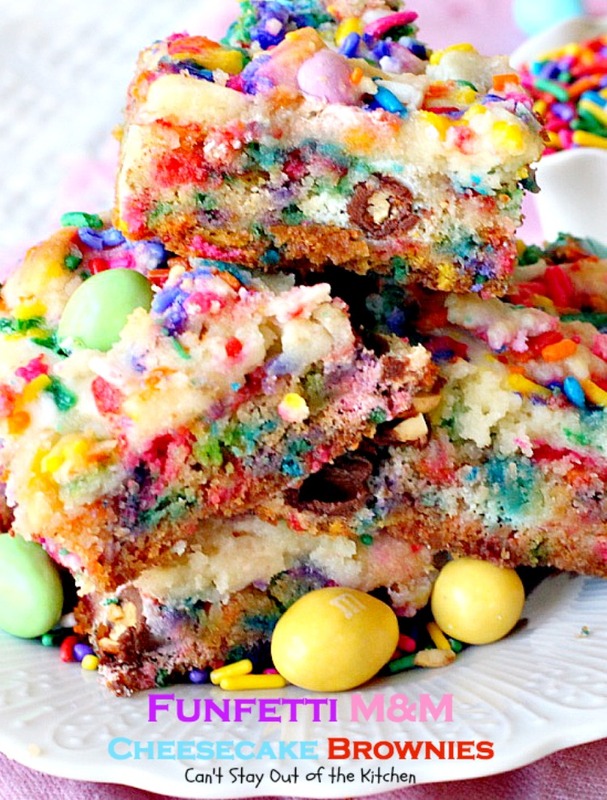 That layer has cream cheese, sugar (in the cup), eggs and vanilla. That’s all it is. 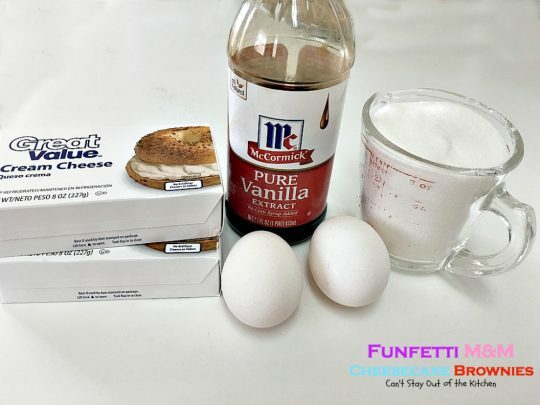 Once you blend it, it becomes moist and creamy. Enjoy. This is a terrific recipe. Looks right down my alley Teresa!! 🙂 Pinned! I’m sure it does, Kim. 🙂 Thanks for stopping by.